For me, Amazing Spider-Man #154 stinks. 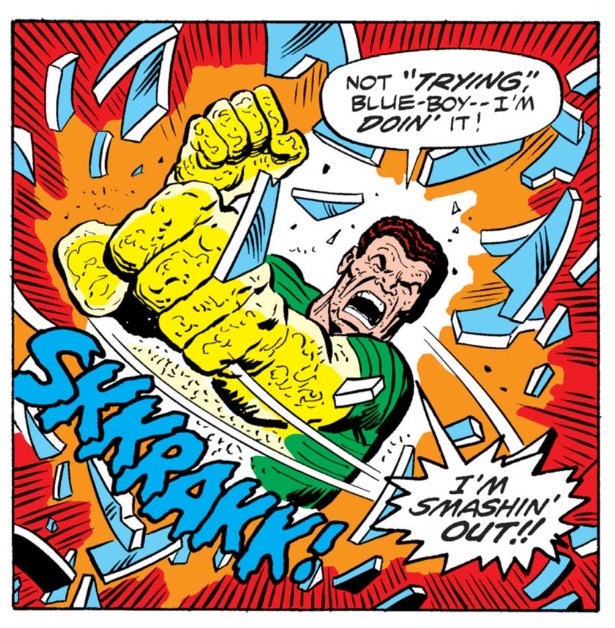 No, that’s not a critique about the quality of the Len Wein/Sal Buscema story (though seriously, that costume they picked out for Sandman during the 1970s was absolutely hideous). Nor is it really a comment on the overall condition of the comic (though no one would mistake my copy as being a high grade one). Rather, this is a statement about how the comic smells. It stinks, as in, it does not smell good. What? Were you thinking I’d have something more insightful to say about this comic? Well, since I’m not going to end a post on a blog I update once every two weeks (if even) after a mere 100 words, let me attempt to pontificate a bit more so you all can get your money’s worth. Namely, why is it that every time I look at a copy of ASM #154, I think about old, musty-smelly basements and not Spider-Man superheroics? Sure, on the long list of memorable Spider-Man/Sandman confrontations over the years, ASM #154 would rank somewhere on the lower half of the list (again, it’s not a bad story, but this is a fairly generic Spider-Man vs. a bad guy of the month comic featuring one of his more atypical and powerful foes in Sandman. 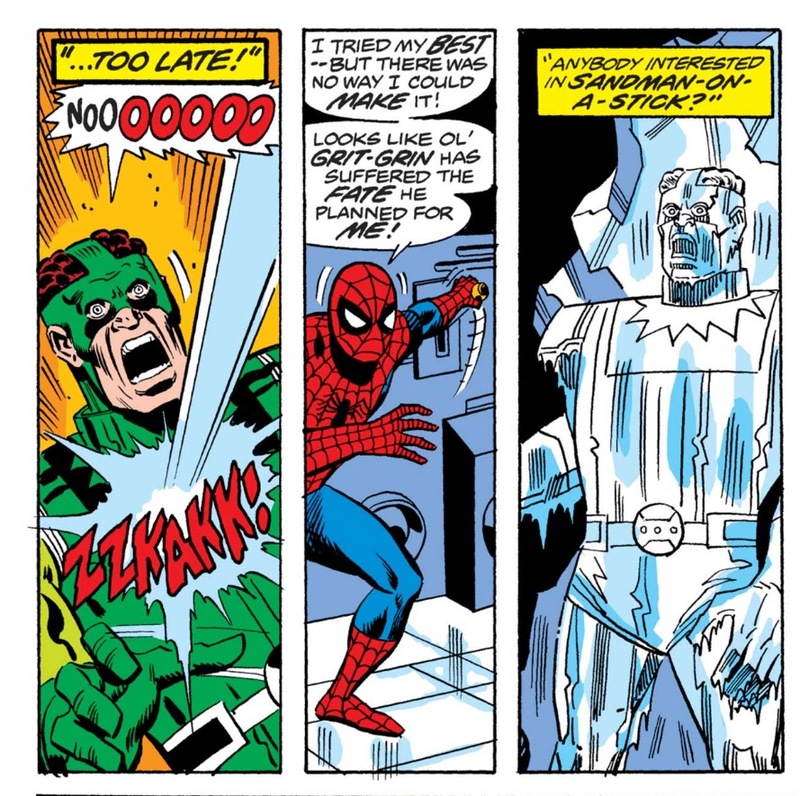 If anything, this comic is only notable for how callously Spider-Man reacts after Sandman accidentally gets cryogenically frozen at the issue’s end — Spidey is basically acting like Willy Wonka feigning concern for one of the miscreants visiting the chocolate factory when this all goes down). For one, I am not the one responsible for how this comic smells. But seriously, the fact that I have no context for why this comic smells the way it does has always been part of its allure and aura for me. And again, let me emphasize, this comic stinks. Certainly everybody has some old books in their collection that were either left in somebody’s basement unprotected in a box somewhere for too long, or possibly inside the house of somebody who smoked a pack a day, which in turn give off some musk. But, at least for my collection, my copy of ASM #154 exists in a smelly class of its own. I first discovered the smells — naturally — the day this comic came into my possession. Unfortunately, this discovery was NOT made BEFORE I put money down on the table and purchased it, because otherwise, I probably would have never had picked up THIS copy of ASM #154, and thus, I wouldn’t have a story about a stinky comic book. The exact year I picked this book up is a bit of a mystery to me, but I can place the timeframe to somewhere around 8 or 9 years ago. It was definitely post-Big Box of Comics, but pre-closing stages of the chase, because I was still making some classic rookie collecting mistakes when it came to picking up individual issues from the Bronze Age era. Around this time, I owned pretty much every issue of Amazing Spider-Man between issues #200-400 and I was also subscribing to the book and getting it mailed to my house every month (starting around ASM #503). I wanted to start filling those holes in my collection from the Bronze Age, but I was still hesitant about making the major investments needed to start picking up many of those key issues from the Stan Lee/Steve Ditko/John Romita days. Additionally, web sites like MyComicShop were still off my radar, so the way I saw it, I had three options to get these comics: online auctions, which turned me off because most of these comics were being sold individually and paying an additional $4-5 for shipping seemed inefficient to me; back issue bins at local comic book shops (until I rudely discovered that back issue bins at local comic book shops were a relic from the 90s and were not coming back in most cases); and lastly local comic book shows and conventions. Like the back issue bins, finding local comic book shows was a difficult proposition. I didn’t want to go to a big convention because, even at that stage of my collecting education, I understood that with a few notable exceptions, it was difficult to find a bargain at a con. Instead, I kept thinking back to a simpler time (junior high school) when I attended a small monthly comic book/collectible show held at some meeting/conference room at a nearby hotel on Long Island. There were maybe a dozen or so vendors at these shows, but they came with long boxes jam packed with old Silver and Bronze Age comics at very reasonable prices. If I could just find something similar to that as an adult, I could fill those Bronze Age gaps in my ASM collection (plus,as an adult, I wouldn’t have needed to beg my mom or dad for a ride to the hotel). Fortunately, via the power of Google, I did discover that if I was willing to cross a bridge into New Jersey, I would find a somewhat similar experience to my glory days of harassing vendors at the Holiday Inn in Rockville Centre. I say “somewhat similar” because either my perspective had been irreparably altered by the lens of childhood, or the times had just simply changed. Regardless, I was able to track down some of the comics I was looking for, but I wasn’t bowled over by a plethora of options either. But I bought what I bought because it was there and available to be purchased. In other words, I settled. And while I don’t think I was ripped off by anyone, I also wasn’t savvy or patient enough to shop around for something better. That’s how one gets stuck with a comic that smells like an old shoe. I had already driven ALL THE WAY TO NEW JERSEY (do you know how far that is for a kid living in New York City? Like 30 whole friggin minutes!). If I didn’t buy those comics then and there, I might have regretted that decision for the rest of my life. Melodramatic? You bet. It was also foolish. When I finally happened upon this copy of ASM #154, my main focus was the price. It looked “good enough” to my eye and the price was reasonable. Purchase done. Maybe if I had taken it out of the bag and more closely examined the comic, I would have immediately have gotten a waft of whatever smells the book had been exposed to over the past few decades. Maybe then history would have been changed and I would have come to own a completely differently, scent-free version of ASM #154. 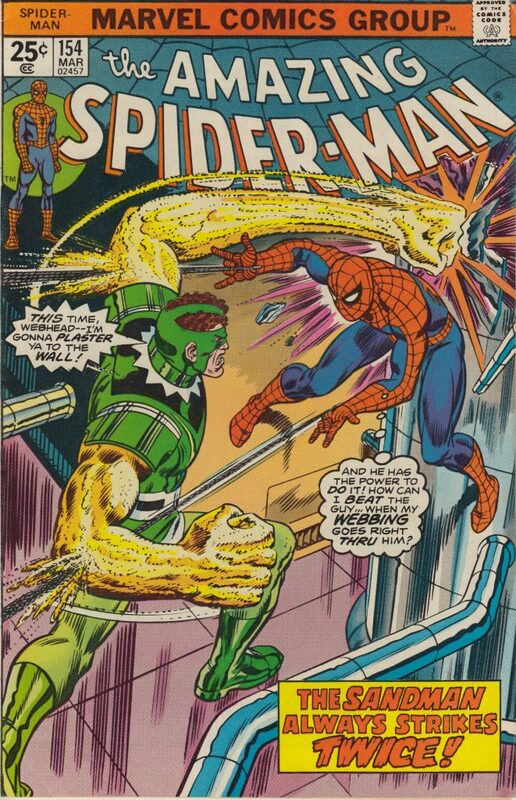 Then again, I also wouldn’t be able to say a Spider-Man comic that I own “stinks” without it sounding derivative and mean. Oh well, I guess having this story is better. Blasphemy sir,#154 was my first purchase of a an amazing spiderman book,so it will forever be near and dear to me and never stink! I have since upgraded that well enjoyed issue and can assure you both my copies smell like strawberry fields.I also enjoy the smell of a 60’s Dc or marvel comic pulled right out of the mylar. Oh, this feels good. Commenting on my favorite blog again. I still can’t get over Sandman’s costume in this story. Who approved this to make a printed page? 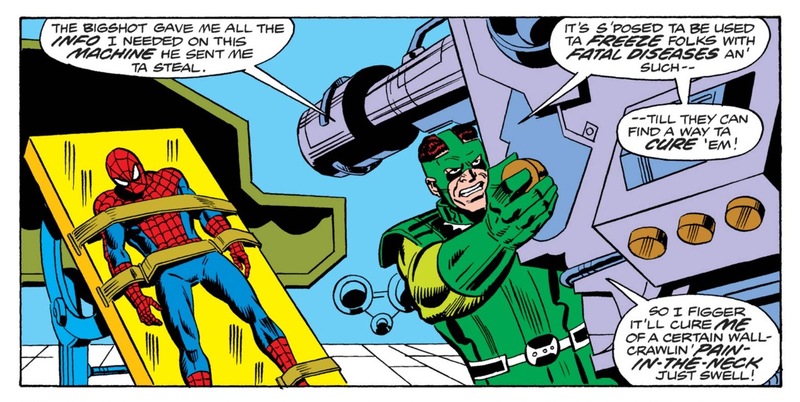 You’ve got a classic Ditko design with no need to be updated and instead you make him look like a guy whose head is stuck in a vice? The one Spidey villain whose look should shout unrestrained, and he’s layered in shiny metallic armor, with a thong stretched across his head… I just can’t even. Also, how does smell effect CGC’s grading? If you had a perfect Amazing Fantasy #15 fresh off the press but it smelled like a skunk, does it get a 10?